Is this how the Nintendo 3DS will work? Though not confirmed by Nintendo, it has been suggested by a number of sources that the 3D display used in the upcoming Nintendo 3DS is to be based on the parallax barrier LCD from Sharp. But how does it work? Up until recently, to view 3D graphics it has been necessary to wear polarizing (or red and blue) glasses to separate the images and fool the brain into perceiving the image as having depth. 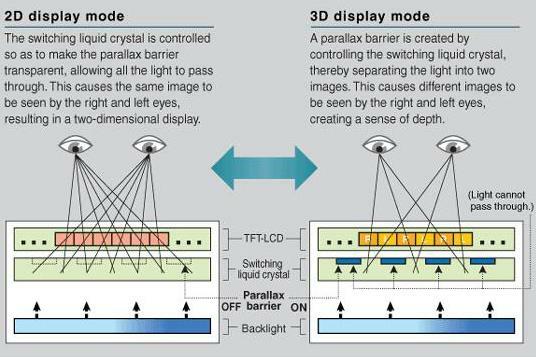 Sharp's 3D LCD uses what the company calls a "parallax barrier" system which is implemented by using both a conventional TFT LCD display and a specially developed "switching liquid crystal." According to information distributed by Sharp, "The distance between the human eyes is about 65 mm, and the images seen by the right and left eyes are always slightly different (binocular parallax.) The human brain processes the slightly different images from the two eyes to create a sense of depth. The directions in which light leaves the display are controlled so that the left and right eyes see different images. This makes it possible for the image on the screen to appear in three dimensions without the user having to wear special goggles." Still flummoxed? The diagram above is designed to illustrate how the system works for both 2D and 3D images.